A Capacitor is an electric component formed by two electrical conductors separated by an insulating material. Multilayer ceramic capacitor (MLCC) consists a number of layers of ceramic inner electrodes in a sandwich structure. MLCC is a surface-mounted device (SMD) capacitor, which is used in a wide range of capacitance applications such as telecommunications, data processing, PCs, hard disks, game PCs, DVDs, video cameras, mobile phones, general electronic circuits, and others. The Global Multilayer Ceramic Capacitor (Mlcc) Market is segmented on the basis of class, application, and region. Based on class, the market is categorized into class 1 and class 2. Class 1 is subdivided into NP0 (C0G), P100, and others (N33 and N75). Class 2 is further classified into X7R, X5R, Y5V, and others (Z5U and X7S). By application, the market is categorized into consumer electronics, automotive, manufacturing, healthcare, and other (defense and aviation). Region wise, it is analyzed across North America, Europe, Asia-Pacific, and LAMEA. Enhanced frequency characteristics of MLCCs and high resistance of these capacitors to abnormal voltage impact the market growth. Moreover, performance advantages offered by MLCCs such as high capacitance & lower impedance and their compact size boost the growth of the market. In addition, highly prone to physical damage such as cracking, increasing automotive electronics, and upsurge in demand of the consumer electronics affect the growth of the global market. These factors are anticipated to either drive or hamper the market growth. MLCCs possess low equivalent series resistance (ESR). ESR is the resistance component of a capacitors internal electrode. Furthermore, a high ESR generates high amount of heat due to resistance component, as well as degrades the frequency of the impedance (the effective resistance of an electric circuit). Hence, there is a requirement of low ESR whenever a capacitor is mounted around any semiconductor chip for the purpose of decoupling to absorb noise. With the help of MLCCs frequency characteristic, the impedance improves, which drives the growth of the global market. The potential risk of failure due to breakdown of dielectric can be minimized irrespective of the surge or pulse voltage generated within the device when a multilayer ceramic capacitor is attached in electronics device such as TV and radio. This makes MLCC highly resistant to abnormal voltages, which propels the growth of the market. Rise in demand for consumer electronics has been increasing, especially in the developing countries such as India, China, and others. Factors such as increase in disposable income, and emerging middle class further propel the demand for consumer electronics, thereby propelling the market growth. This is attributed to the fact that consumer electronics such as televisions, mobile phones, MP3 players, and other such devices are incorporated with a number of capacitors. In addition, smart TVs and LED TVs have already replaced the traditional CRT TVs. This in turn is anticipated to create numerous opportunities for the key players operating in the global MLCC market. 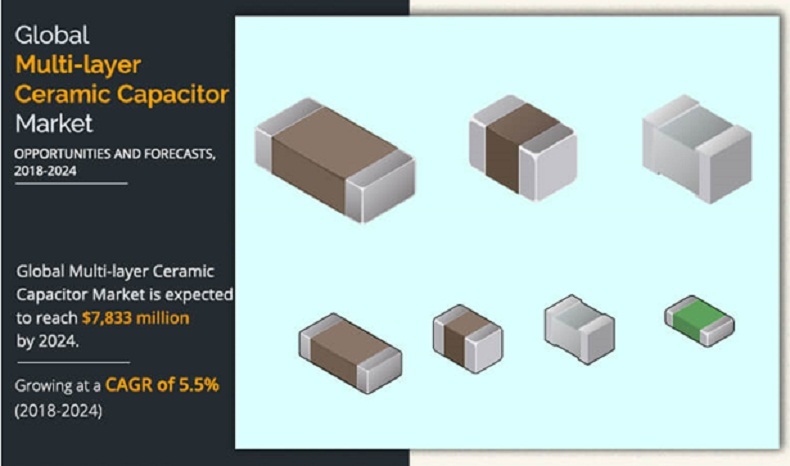 This study comprises analytical depiction of the global multilayer ceramic capacitor market (MLCC) with current trends and future estimations to depict the imminent investment pockets. 3.5.2.1. Highly prone to physical damage such as cracking. 7.4. MURATA MANUFACTURING CO., LTD.
7.5. SAMSUNG ELECTRO-MECHANICS CO., LTD. 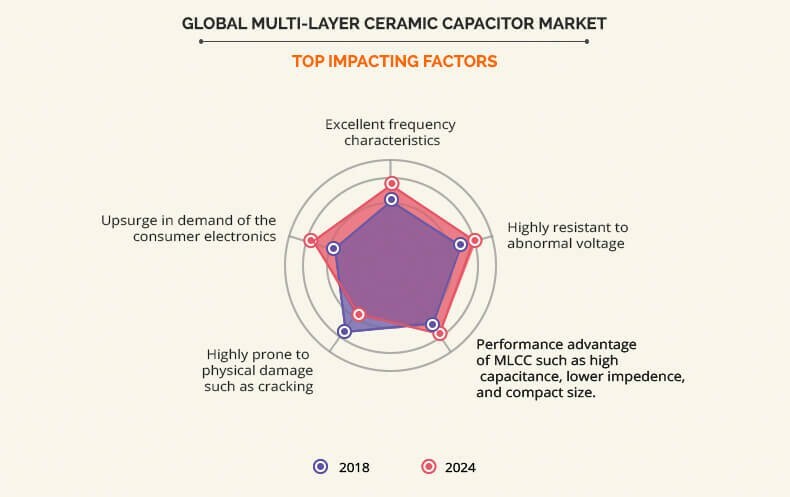 The multilayer ceramic capacitor (MLCC) market possesses high growth potential, owing to increase in demand for multilayer ceramic capacitors from the developing countries such as China, India, and others. 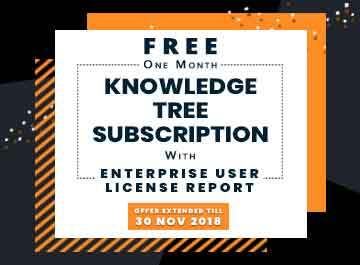 Companies in this industry adopt various innovative techniques such as product launch, innovation, and merger to provide customers with advanced and innovative product offerings. Enhanced frequency characteristics and high resistance to abnormal voltage significantly contribute towards the growth of the global MLCC market. Moreover, performance advantages offered by MLCC such as high capacitance & lower impedance and its compact size are major drivers of this market. However, MLCCs are highly prone to physical damage such as cracking, which impedes growth of this market. Conversely, increase in need for automotive electronics and upsurge in demand for consumer electronics are expected to create lucrative opportunities for the key players operating in the global market. In addition, increase in trend of Internet of Things (IoT) & 5G technology and upgradation of automotive electronics are expected to boost the demand for MLCCs in the near future. Furthermore, the key players are focusing more on the automotive-use MLCCs rather than the ultra-compact MLCCs. This indicates that the automotive sector possesses high growth potential, which in turn is anticipated to provide lucrative opportunities for the expansion of the MLCC market. Among the analyzed geographical regions, Asia-Pacific is expected to account for the highest revenue in the global market throughout the forecast period, followed by North America, Europe, and LAMEA. 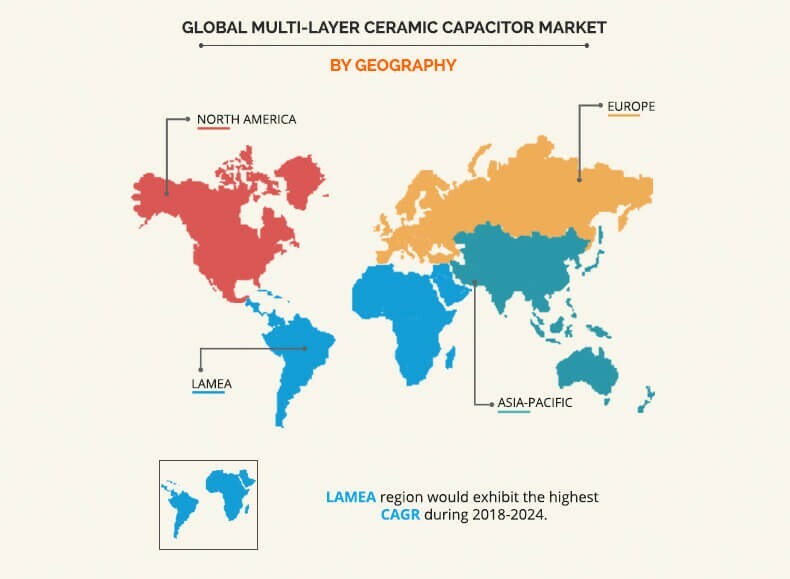 However, LAMEA is expected to grow at a higher rate, predicting a lucrative market growth for multi-layer ceramic capacitors. Murata Manufacturing Co., Ltd., Samsung Electro-Mechanics, TDK Corporation, Kyocera (AVX), Taiyo Yuden Co. Ltd., YAGEO Corporation, Walsin Technology Corporation, KEMET, Vishay, and Darfon Electronics Corp are the key players that occupy a significant revenue share in the market.